The fan’s have asked for the four members of this team to get some representations in 6-inch scale action figure form for years and finally in Hasbro’s The Return of Marvel Legends Wave Two we have Thunderball from the Wrecking Crew! 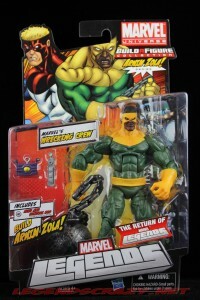 But wait; Hasbro also gave us a second member of the team in the same wave with the Piledriver running change. Woot! I really love this figure too! He’s huge and he comes with his signature weapon of choice a huge enchanted wrecking ball and chain (Enchantment not included, of course). 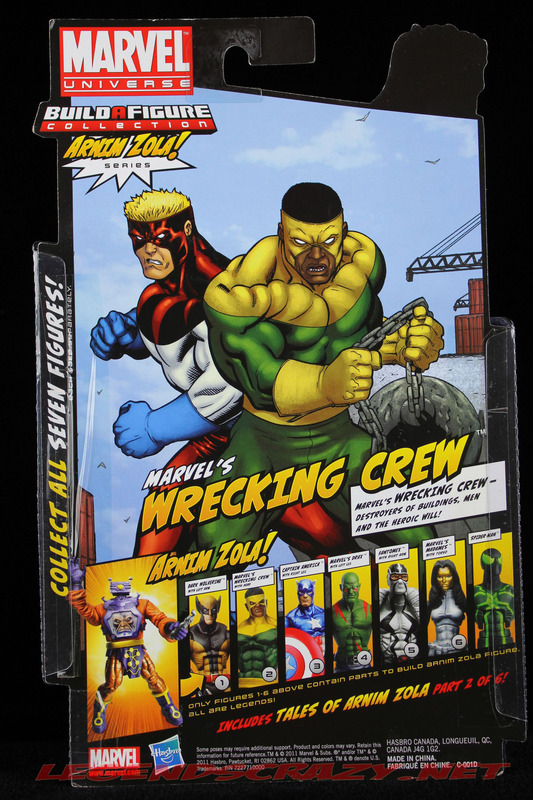 The Wrecking Crew has fought nearly every Marvel Comics hero and team at some point. They never seem to be victorious though. They break out of jail, fight some heroes, lose the battle and get put right back in jail again. 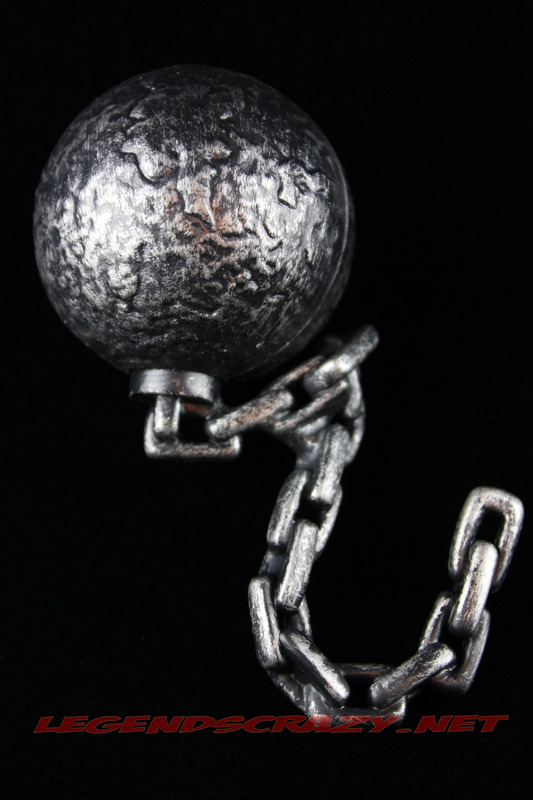 Thunderball has genius-level intellect, superhuman strength, speed and endurance and uses an enchanted wrecking ball. Dr. Eliot Franklin aka Thunderball met the other three members of the Wrecking Crew while serving time in jail for trying to steal back the plans for a Gamma-Bomb he had created. Franklin helps Dirk Garthwaite (Wrecker) retrieve his enchanted crowbar, the four convicts then break out of prison together. The four men then form a circle and hold Wrecker’s crowbar together during a lightning storm. 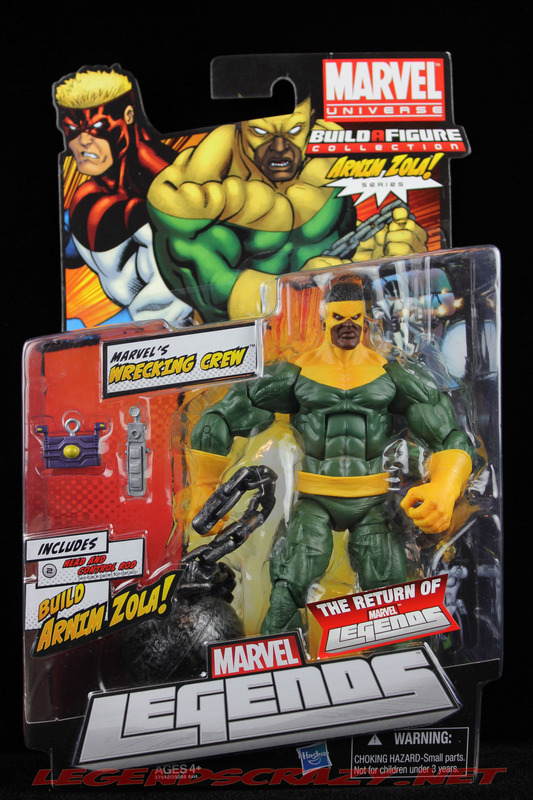 When lightning strikes the mystical crowbar the four men are powered-up by the enchanted crowbar and transformed into the Wrecking Crew; Bulldozer, Piledriver, Thunderball and Wrecker. This figure uses almost all the same parts as the Warpath from the Deadpool and Warpath two-pack. 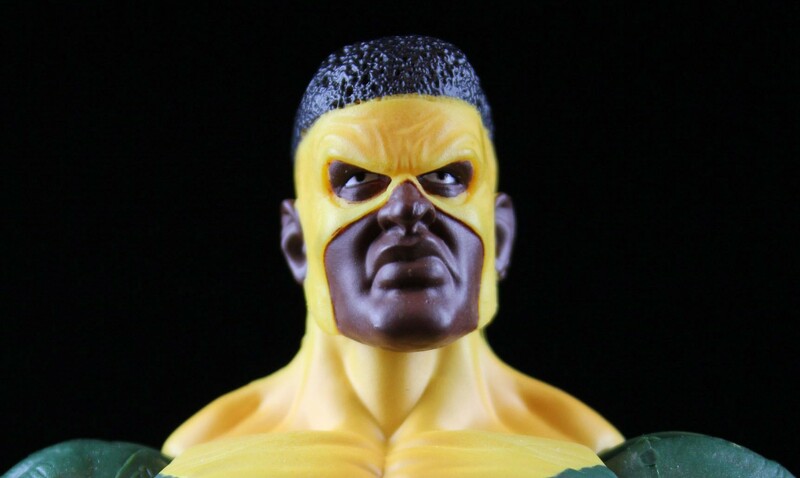 The head sculpt is amazingly accurate to the comic book version of Thunderball. The scowl on his face, the wrinkled brow, the pursed lips and the menacing stare all help him to say; That’s right, I’m bad! 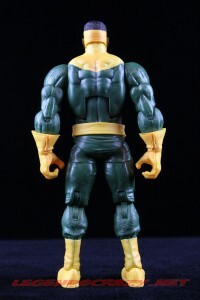 Hasbro has sculpted some new gloves/hands which still swivel at the mid-forearm point as they did on Warpath. 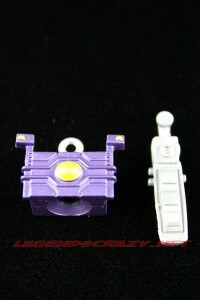 Beyond that, the only other new parts are the hinged hip cut, the upper thigh and the belt. They also left off the straps that were around the top of Warpath’s boots. 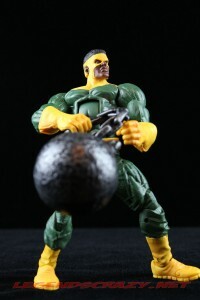 I would have liked some wrist articulation for both Thunerball and Piledriver but you can still get some pretty good poses without it. 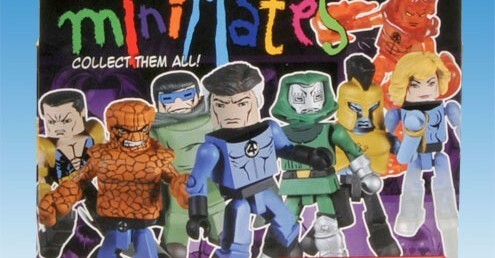 I actually like the new hip and thighs which have a hinge similar to Mattel’s DC Universe Classics figures. 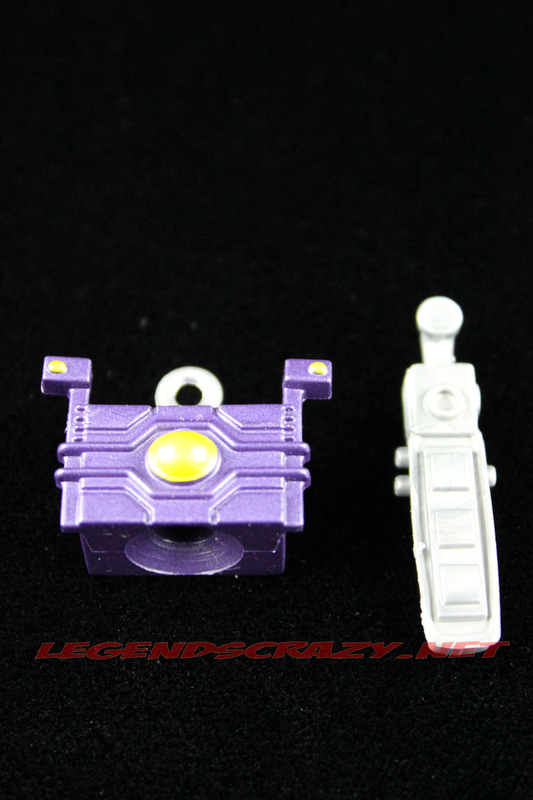 The hinged hip with the swivel cut in the upper thigh looks much nicer. 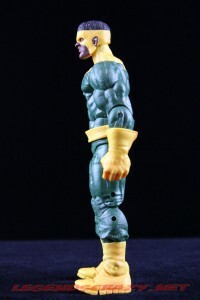 It makes the sculpt look a little more fluid and human-like than a ball-joint would but, you still get a pretty good range of motion in the hip area for stooping and squatting action poses. We have basically two colors on this figure, yellow and green. 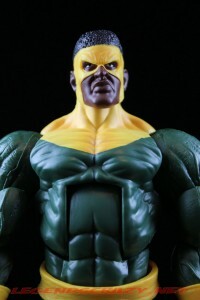 The figure is molded in the color green. 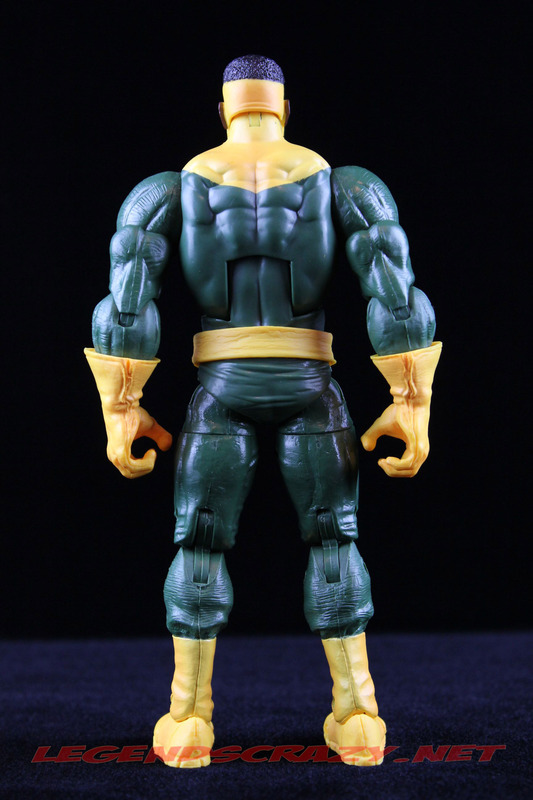 The yellow painted parts are on the mask, upper chest and the lower thighs or top half of the boots. 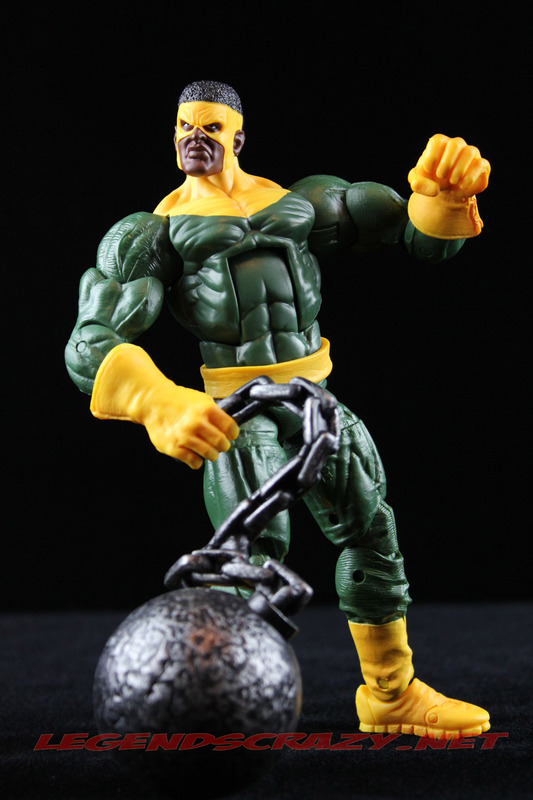 The gloves, feet and belt were molded in yellow. 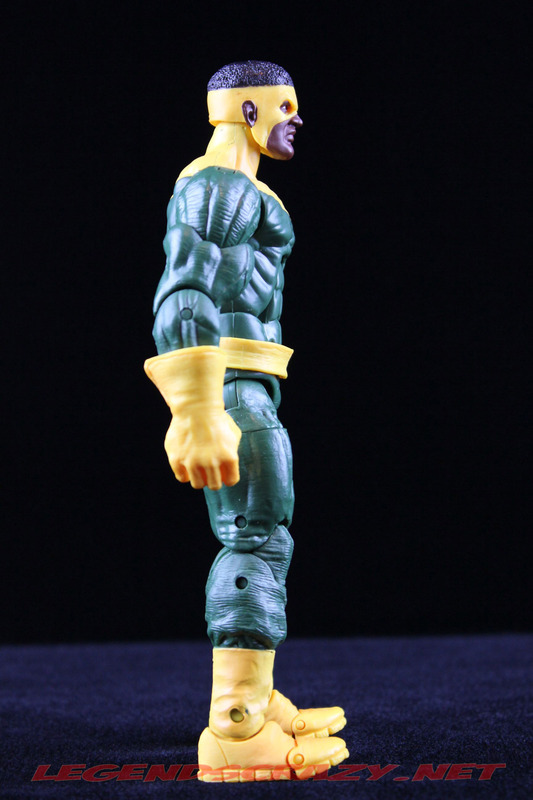 This is another of the cases where Hasbro’s minimal paint apps works very well. 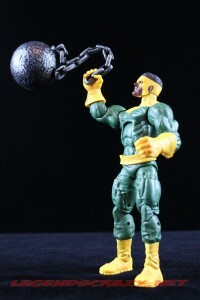 I’m still not sure if I would have prefered for the chain on the wrecking ball to have been a real moveable linked plastic chain or the sculpted version Hasbro gave us. You can get some great poses with him holding the ball up in a striking pose or above his head with this the stiff chain. 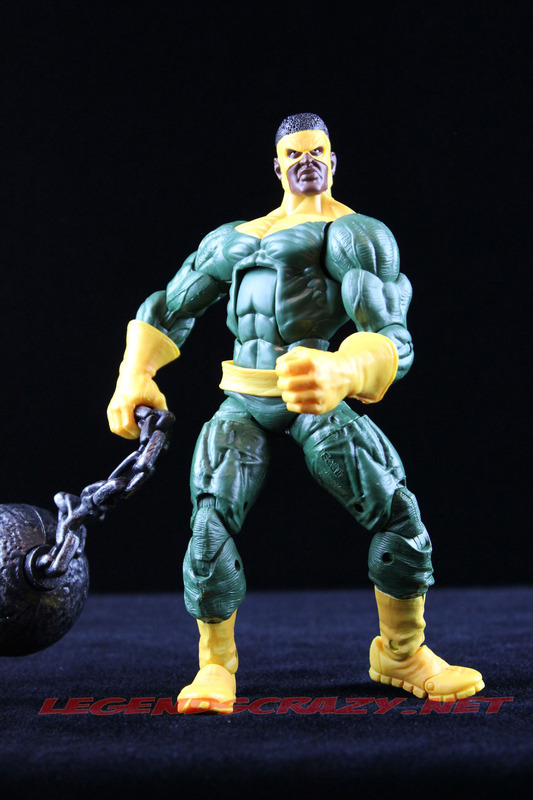 I still wonder though if the look of the chain would have been better with the way they did Absorbing Man’s in the Hulk/Fin Fang Foom wave. Thunderball has a hinged ball-jointed head, ball-jointed shoulders, bicep swivels, double-pinned elbows, and forearm swivels. He has an ab-crunch, cut waist, hinged hips, upper-thigh cuts, double-pinned knees, pinned rocker ankles and a toe hinge. 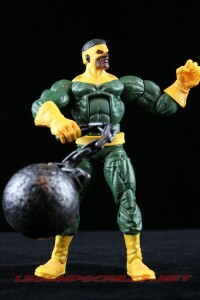 He comes with an awesome wrecking ball and chain and the head and the “Prod” instrument for the Arnim Zola Build-a-Figure. I was lucky to have found a Thunderball behind some other figures in a Toys R Us like someone was hiding him to come back later for. 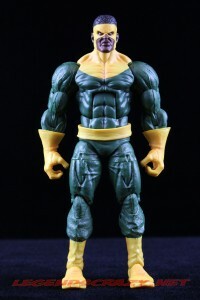 I hated to have to pay the premium price of $19.99 that Toys R Us was selling Marvel Legends for but, I’m glad I did because I haven’t seen another one since that. 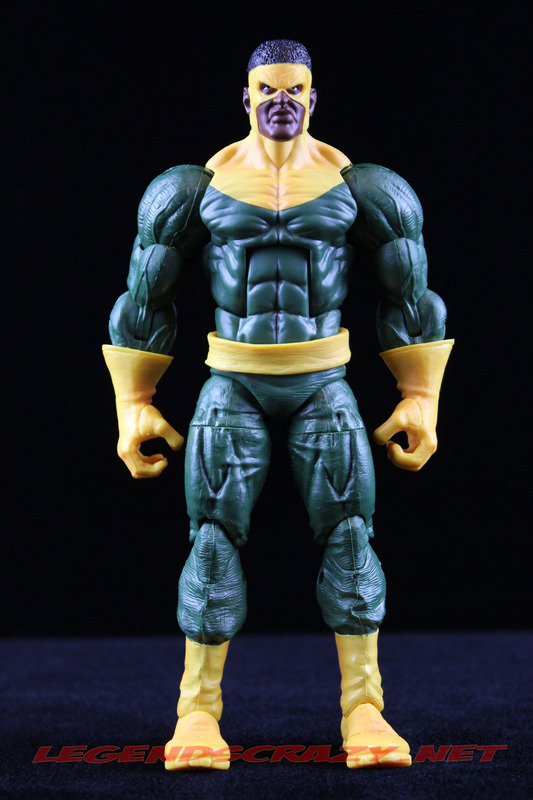 From what I’ve read on the forums most people aren’t seeing the first half of this wave with Thunderball, Madame Masque and Masked Dark Wolverine becoming increasingly hard to find. “Big Time” Spider-Man is another story it seems, but we’ll talk about him some more in the Future Foundation Variant Spider-Man’s review tomorrow.